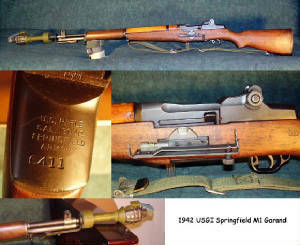 This is the pride of my collection - a USGI Springfield M1 Garand. I got it form the Civilian Marksmanship Program. It had two small holes on the side of the stock when I got it and a little research showed that they were from a grenade sight that was installed during the war. I decided to restore it as best I could. I found a grenade launcher, dummy pineapple grenade, and a grenade sight. Now it enjoys a special place on my rack reminding me everyday of the price of the freedoms I enjoy.